It’s a Super Six Hundred Celebration! 3) To enter, leave a comment on this thread that responds to these questions: 1) if I started to include podcasts, what topic(s) would you like to hear about? 2) Is there a fly I tie that you’d like to see a video on? Which one? One entry per person. Deadline for entering is 11:59pm March 31, 2018 (no foolin’). Three winners will be chosen at random. The winners will be notified in the comments section of this thread or by email, and will be responsible for sending me their address so I can ship the flies out. Sorry, I can only ship to U.S. addresses. It’s getting closer to Hendrickson time. Maybe you’ll have some swag like this come April. Congratulations! One of the possible prizes is the six striper soft-hackles I tied for my upcoming American Angler article. Ray gets first dibs on them. If he doesn’t want them, Rick gets next dibs, etc. If no one wants them, I will fish them myself. So there. Winners, please email me (swculton at yahoo) and let me know what you’d like. Your other options are a selection of trout streamers, trout wets, or steelhead flies. I also need your mailing addresses. Please don’t post those here. I would like to thank everyone who entered. Your comments were both insightful and helpful. Best of all, they were just plain nice. It was truly gratifying to hear from so many people, and I feel like I got to know each one of you a little better. 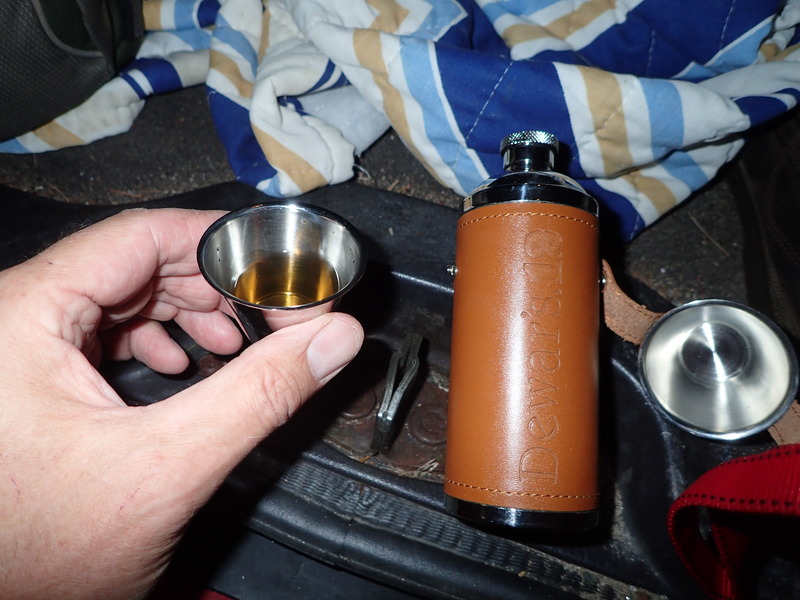 A middle-of-the-night fishing trip toast to the winners. Wait — a toast to everyone. Thank you for your readership and support. You’ll find this pillow on the couch in the TV room. 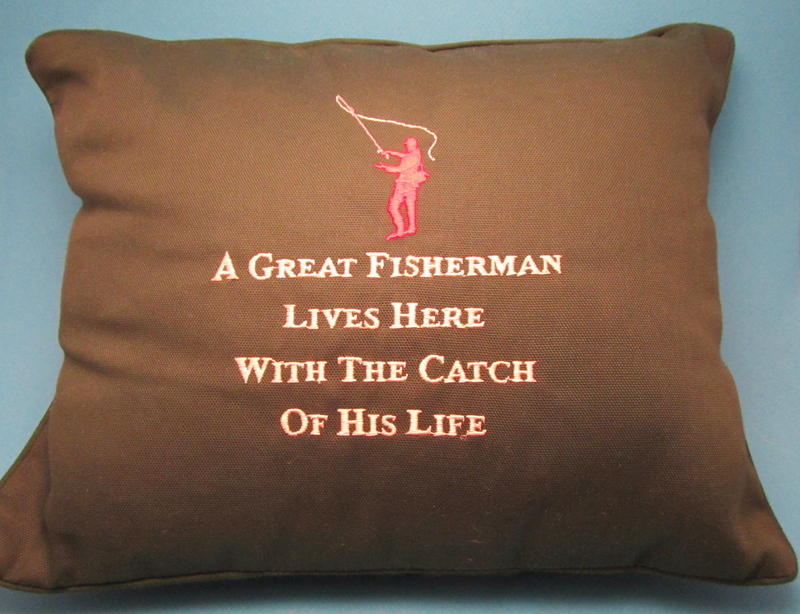 I cannot vouch for the great fisherman part. But I can tell you with absolute certainty that I married very, very well. I really did. 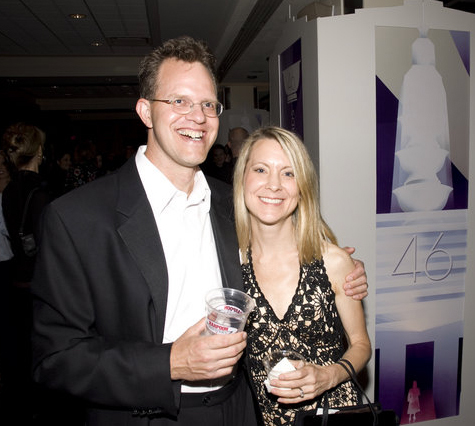 We’re celebrating our fourteenth anniversary today. I hope everyone had as nice a Thanksgiving Day as I did. Among my many blessings are all of you who read and follow currentseams. Thanks so much for taking the time to read and comment on the site. Thanks to those of you who travel to see me speak. And thanks to those of you who have taken a class with me or let me be your guide. I truly appreciate it. 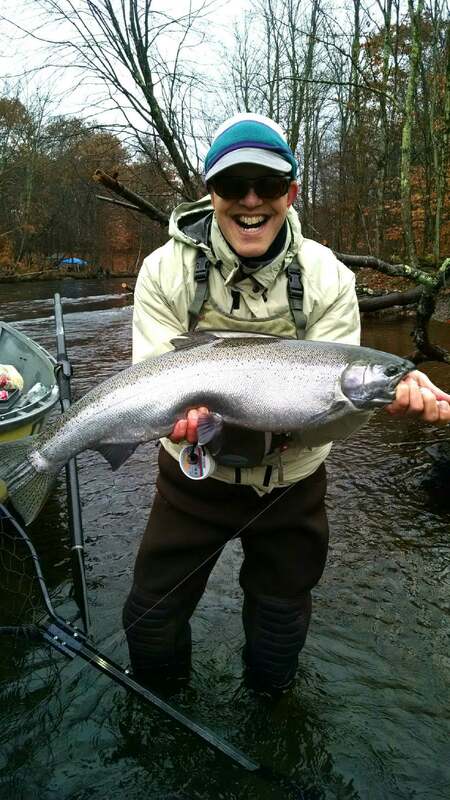 And of course, thanks for being fortunate enough to catch and release amazing fish like this. On Saturday I guided Randy and John from noon to evening. We spent the bulk of our time walking a long stretch of the upper TMA swinging wets. The fishing was great — we barely saw another soul (contrast to Church Pool, populated by a good dozen-and-half anglers when we drove over the bridge). The catching, not so much. Despite the cloud cover and the threat of precipitation, the BWO hatch never really got going. We pricked a few fish, and John lost a pig in a secluded side stem, but other than that it was a lot of casting and wading. That we had such a good time anyway is a testament to my two clients: they fished hard, they fished well, and they realized that some days the bear eats you. John exploring the nooks and crannies of one of the Farmington’s many side stems. Randy working the seams, ready for a take that never came. On to Plan B: catch the evening rise. 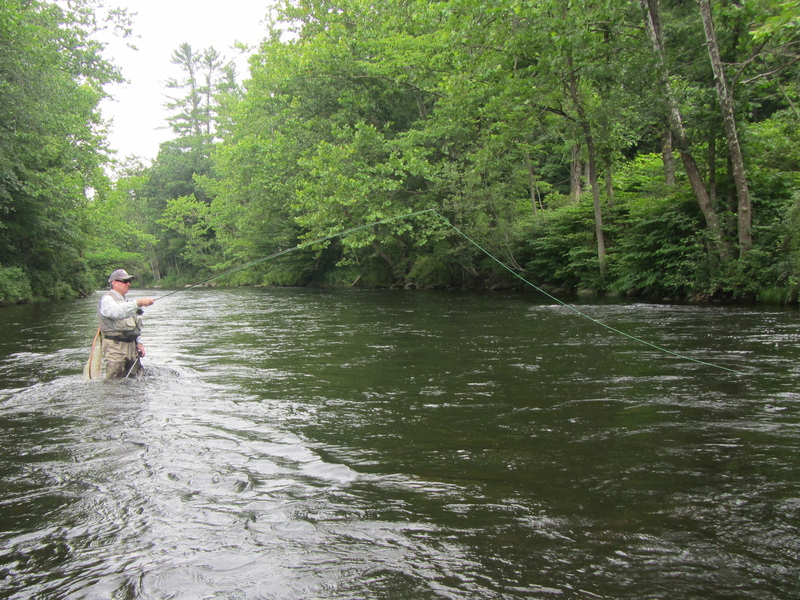 We found some lovely dry fly water at 5pm that we had all to ourselves. By 7pm it looked like we had been teleported to Church Pool. Where the heck did all those people come from? 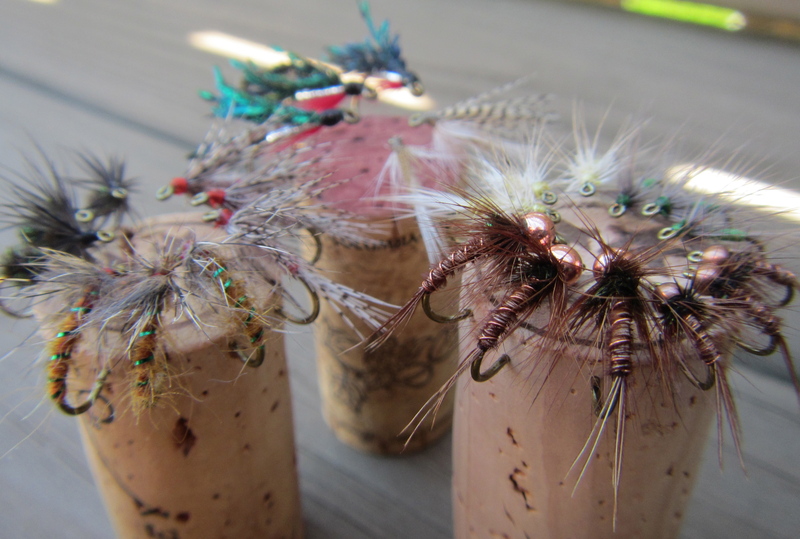 Our focus was on fishing wets like dries, particularly the Magic Fly. The bugs certainly cooperated: sulphurs (size 14 and 18), March Browns, 16-18 BWOs and some size 16 tan caddis. For two-and-a-half hours, it was JV salmon city. Then the trout came out to play. When our time wound up, John and Randy graciously shared the water with your humble scribe. I was fortunate to connect with four lovely wild browns, cookie cutter in their length (10-12″) and unique in their markings: one had an odd scarcity of spots; another was rainbow-like in the density of his spotting; yet another still had faint traces of parr marks. Exquisite. Sunday night I ventured to a different spot to check out the summer steno situation. They did their part, but sadly the trout didn’t cooperate. I had fair enough action from about 5:45pm-7pm (size 16 sulphurs hatching). Past 7pm it was total shutdown, even during the magic hour of 8-9pm. 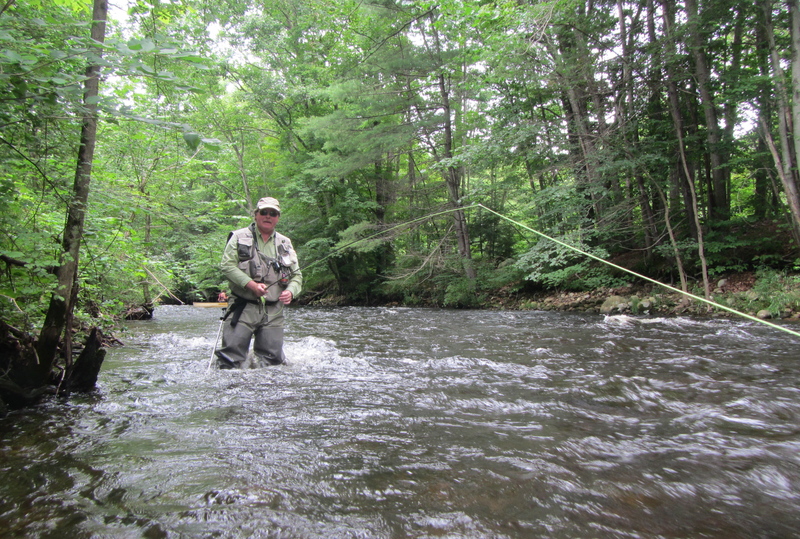 The summer stenos were out in force, but the trout weren’t interested. Massive spinner fall at dark with nothing on it. Perhaps when the water warms and drops a bit more (last night 57 degrees and 516 cfs). 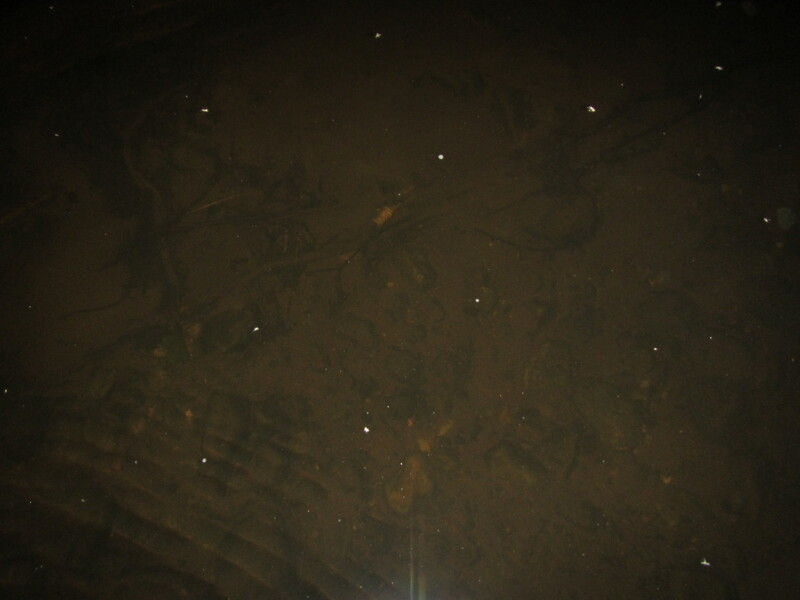 An abundance of spent mayflies on the surface Sunday night, but a strange lack of sippers. I like to say that I go fishing more than any other man who is truly in love with his wife. I’m incredibly lucky to be married to someone who understands the depth of my passion, and goes out of her way to enable me enjoy it. Some of us fish to escape; I’m lucky enough to say that my favorite part of fishing is coming home to my wife. Me and the Missus. I clean up OK. She’s always beautiful. It’s a New Year’s Top 100 Celebration! Wowee! 100 followers of Currentseams. I can’t thank all of you enough for your interest in the site, and I’ll try to continue to provide you with more of the same good stuff in 2014. 2) You must be one of the original 100 followers of currentseams. That means you started following before January 5, 2014. 3) To enter, leave a comment on this thread saying you wish to enter. (Additional flattering comments about me, my writing, or the site will be appreciated, but will have no bearing on your chances of winning. Really.) One entry per person. Deadline for entering is 11:59pm January 12, 2014. The winner will be chosen at random by Mrs. Culton, official accountant and attorney of currentseams. The winner will be notified in the comments section of this thread, and will be responsible for sending me their address so I can ship the flies out. Photo for drooling purposes only. Flies may or may not look like these. You get what you get and you don’t get upset. Flies guaranteed to be lovingly crafted by Steve Culton and doused with an abundance of good fishing karma.